I love the way that art can sometimes offer beautiful solutions to thorny problems and point the way to resolution where there is conflict. That to me is what Numinous, by Sara Hannant, manages to achieve - as well as being a fascinating exhibition of exquisite photography. Numinous is inspired by the tradition of offering votive rags at holy wells and sacred springs. You might say that doesn’t sound like anything to fight over, but in fact many a flame war has raged in pagan groups on the subject of clouties – strips of cloth or ribbons tied to the branches of trees at holy wells. Although the tradition is an old one in some parts of Britian, it has become a so popular over the past few decades that so many clouties (or clooties) are being left – often made of stuff that isn’t biodegradable – that they strangle the trees and can even harm wildlife. In Cornwall, volunteers from the Cornish Ancient Sites Protection Network (CASPN) regularly work to clear litter from holy wells and other sacred sites, whch includes removing clouties that have become unsightly or hazardous. There is often tension between those who leave the strips of rag, intending them to be an offering or physical component of a spell of healing, and those who tidy up after them so the site is safe and clean for future visitors. The idea behind the use of clouties is that each cloth represents the wishes of the person who left it. Traditionally it would be from a garment they had worn, and so would have a little of their spirit or essence. The owner would take a small strip of the fabric, dip it in the water, and then tie it to a tree where it would decompose and become part of nature, taking the wish with it as it transformed. Unfortunately, many modern fabrics do not biodegrade. In Cornwall, the CASPN volunteers, as guardians of these ancient sites, have to remove them before the elements can fulfil the wish. Sara collected the discarded cloths at Cornwall’s holy wells and re-animated them by using the elements of water, air, fire and earth to complete the process. The results are images that combine ritual with spiritual transformation. The title of her exhibition, Numinous, means of, pertaining to, or like numen - divine power or spirit: a deity especially one presiding locally or believed to inhabit a particular thing or place. Her photographs are magical. 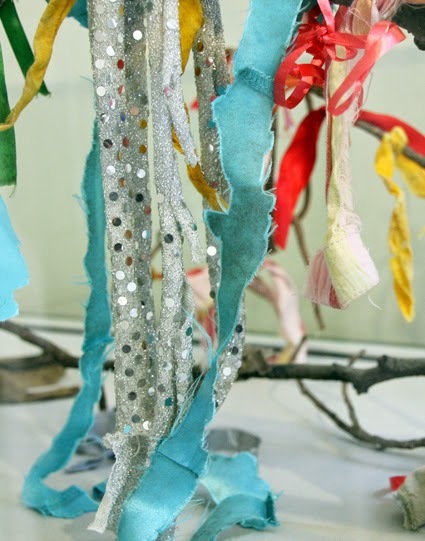 You can see glimpses of the exhibition on this page – colourful strips of cloth in the process of being transformed by the elements and also examples of clouties hanging from real branches. There is something fairy-like about the images, but they also offer inspiration for magical rites that anyone could do instead of leaving non-biodegradable items at sacred sites. By all means visit holy wells, dip a ribbon in the water, tie it to a tree and whisper a prayer or wish, but do not leave it in places where clouties are not welcome. Instead take it home with you and perform your own ritual to offer your wishes to the elements – bury it or tie it to a tree in your own garden, burn it in a bonfire where it is safe to do that, or suspend it in a jar of water from the sacred spring to put on your own altar at home. Or, of course, sign up for a volunteer group in your area to keep sacred sites safe and tidy. 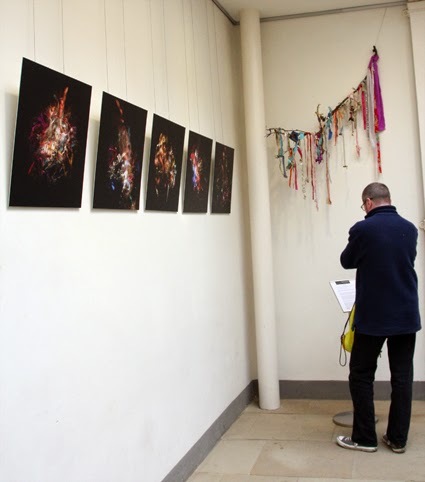 Numinous is on display at Forty Hall Estate, Forty Hill, London, EN2 9HA until 19 July. Opening hours are Tuesday-Friday 11am-5pm; Saturday and Sunday noon–5pm. For more information, visit http://www.fortyhallestate.co.uk or call 020 8363 8196. Sara’s recent work includes the book and Horniman Museum touring exhibition Mummers, Maypoles and Milkmaids: A Journey through the English Ritual Year, Collective Observations: Sir Benjamin Stone to Flickr at Towner Gallery, Eastbourne and Travelling with Unfamiliar Spirits at Cob Gallery, London. She has a forthcoming book, Of Shadows: 100 Objects from the Museum of Witchcraft and Magic. Sara lives in London and is currently a lecturer in Photography at City University. To coincide with the exhibition Sara will be talking about the Numinous at Forty Hall Estate: In Conversation with Sara Hannant, Wednesday 6 May at 7.30pm. Tickets cost £5.